The classic black Double Chronograph by IWC gets a facelift and an innovative material. 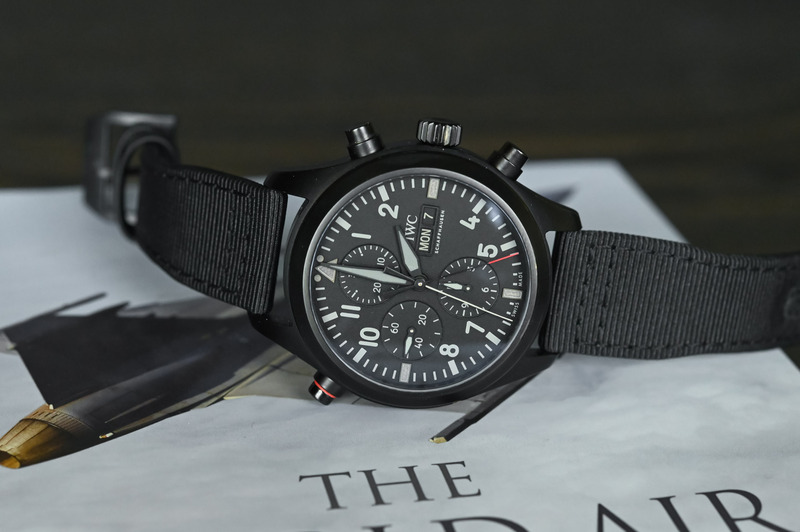 It’s official… 2019 will be the year of the Pilot’s Watch at IWC. Don’t expect to see a remodelling of the entire range – that was already done in 2016, with a new Big Pilot and the Mark XVIII, for instance. However, do expect to see some nice new editions, some good old designs brought back to life, and some mechanical improvements. 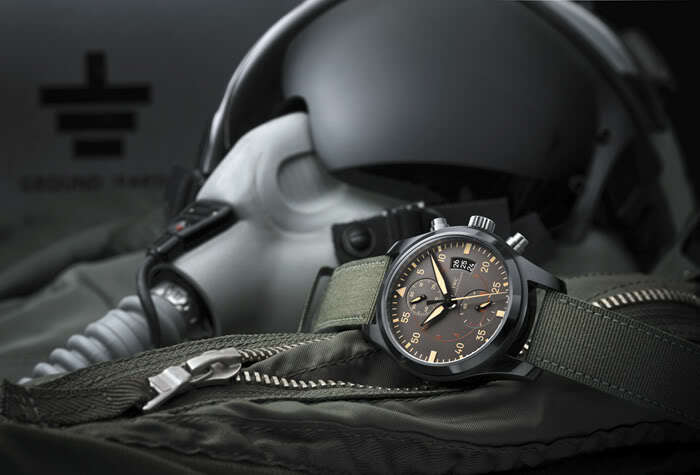 But before the real fireworks start at the SIHH 2019 in January, IWC teases us with four new pieces, including this new Pilot’s Watch Double Chronograph TOP GUN Ceratanium ref. IW371815. This new Double Chronograph IW371815 is the proud descendant of two iconic pieces at IWC. 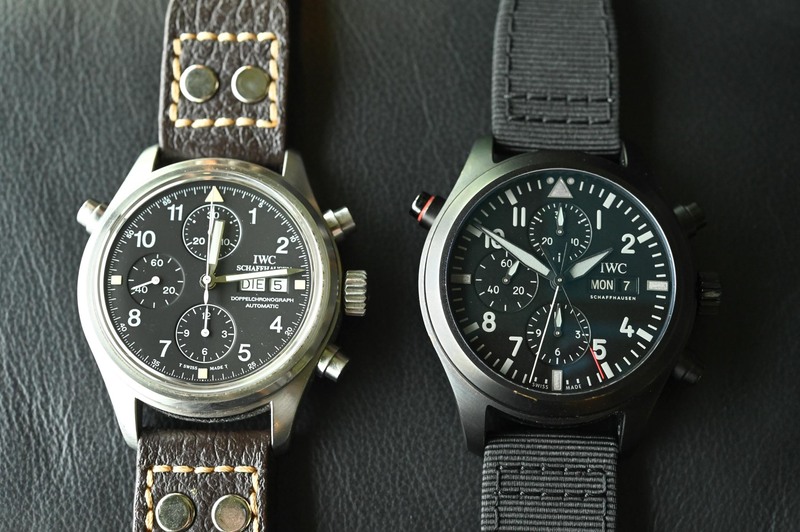 Both watches marked the comeback of pilot’s watches for the brand, back in the early 1990s, with the so-called Flieger Chronographs. 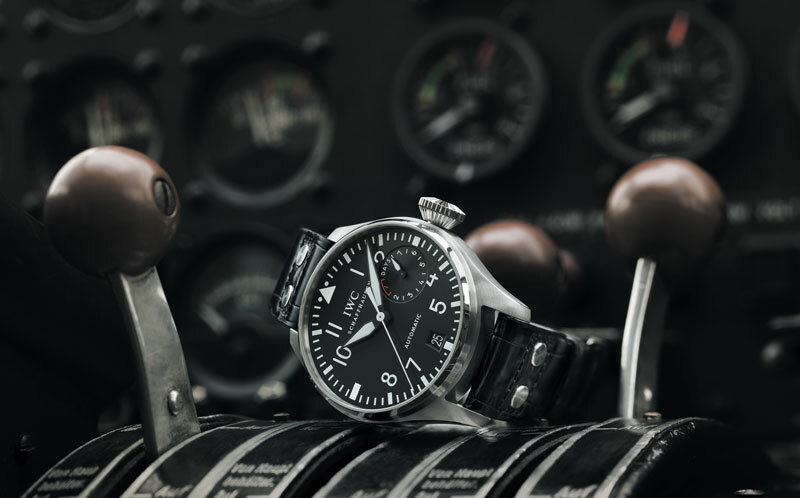 It is well-known that IWC has a long history of pilot’s watches, mainly with WWII B-Uhr (which inspired the Big Pilot) however, the commercial comeback of pilot’s watches was made with stopwatches. 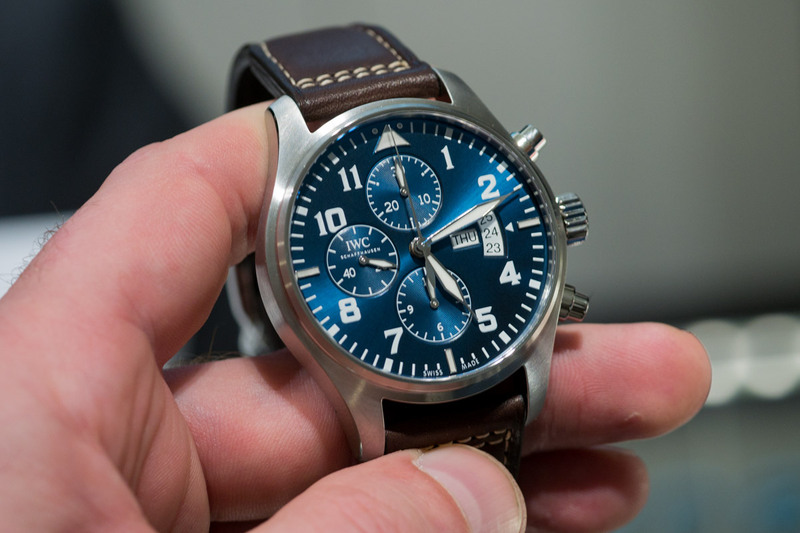 The IWC Doppel Chronograph Ref. 3711, circa 1992. 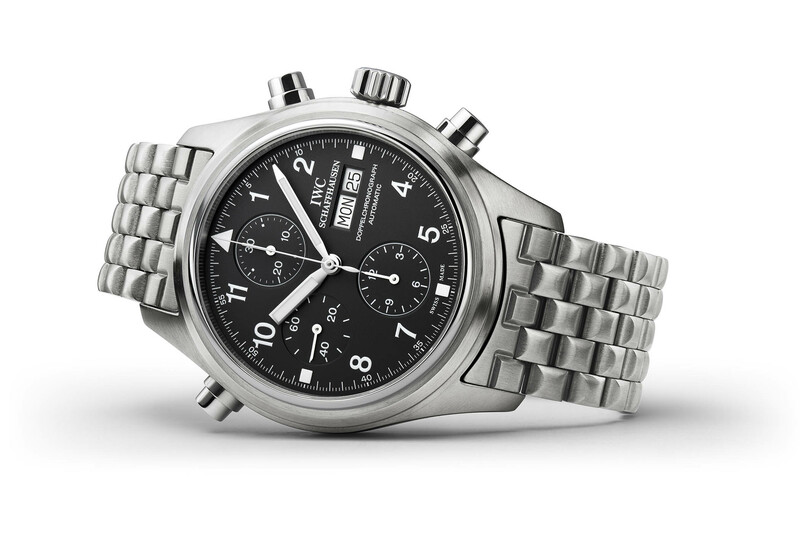 This watch marked the rebirth of Pilot’s watches at IWC and introduced the in-house rattrapante function adapted to an automatic Valjoux chronograph. 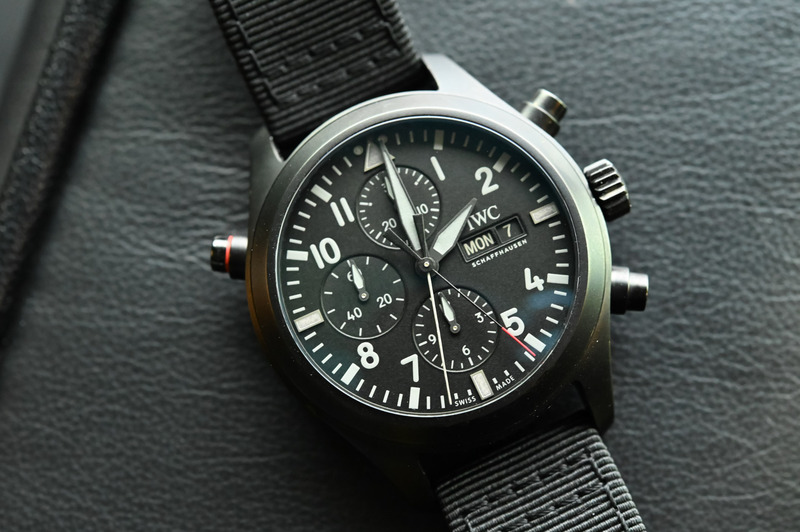 The rare IWC Pilot’s chronograph ref. 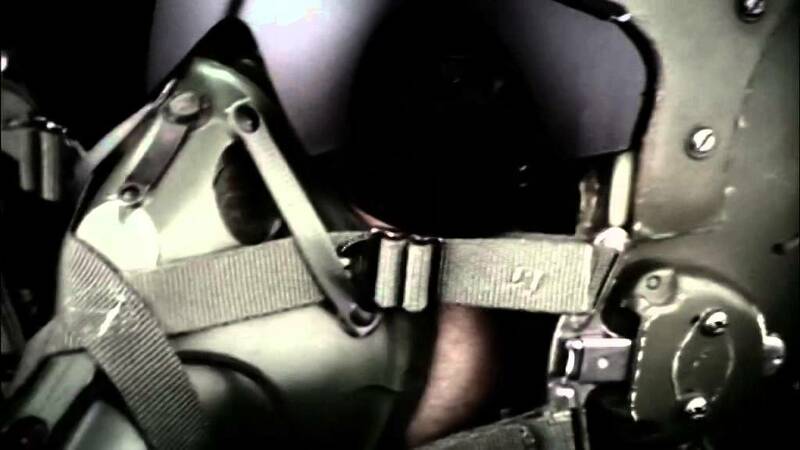 3705 (circa 1994) or “Fliegerchronograph”. This was IWC’s first pilot’s watch with a ceramic case – note the signature steel pushers/crown. This watch was launched simultaneously with a steel version, ref. 3706. Two iconic watches – one for the look, one for the mechanics – were involved in the creation of this new IW371815. The first one is, of course, the DoppelChronograph ref. 3711, a model launched in 1992 that defined the collection for the coming 25 years. This watch, with a 39mm steel case and a no-nonsense dial, featured a great movement, developed on a Valjoux ébauche internally by Richard Habring (and that is still powering the present novelty). The second watch involved in the mix is the rare and now highly collectable ref. 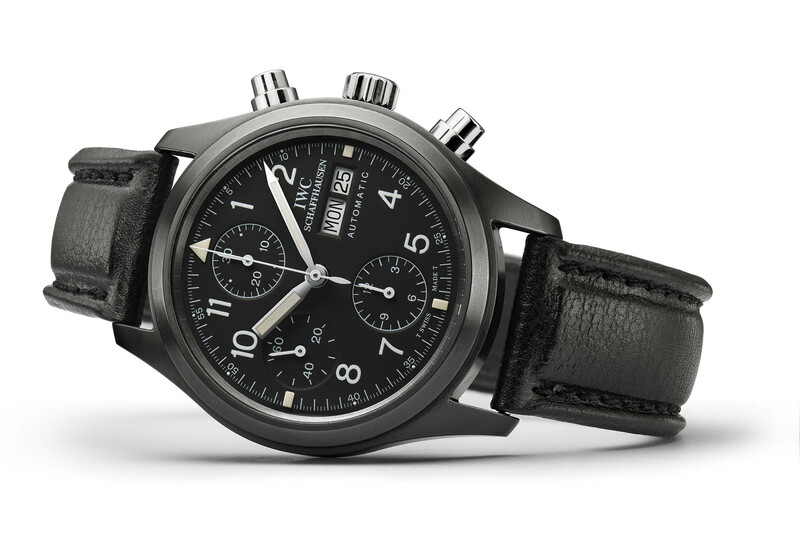 3706, the first pilot’s chronograph made in ceramic – a material that IWC pioneered with the Da Vinci. Its black case is also used in the new watch we’re covering today. 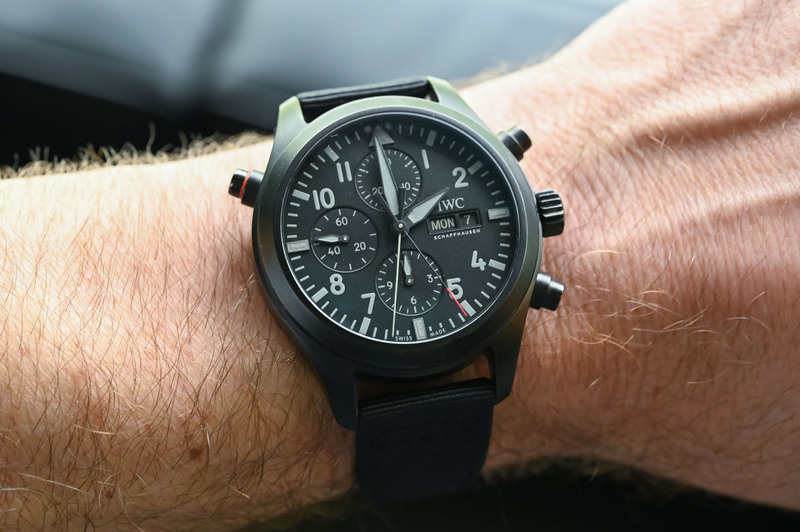 As part of the pre-SIHH 2019 launches, IWC is unveiling this all-black rattrapante/split-seconds/ double chronograph/DoppelChronograph (choose your favourite name). Based on the already existing simple chronograph ref. IW389001, it now displays several evolutions. The first and main update is the addition of the calibre 79230 with rattrapante function. This movement, used for more than 25 years at IWC, is not only extremely robust and simple but is also one of the most accessible split-seconds chronograph movements available. Based on a Valjoux ébuache – with which it shares most specifications – IWC internally adds the rattrapante function but maintains the automatic winding (on the contrary to the Portugieser). Also, in the same vein as the 3711 and 3706, it retains the day-date indication at 3 o’clock. The second evolution is visual. 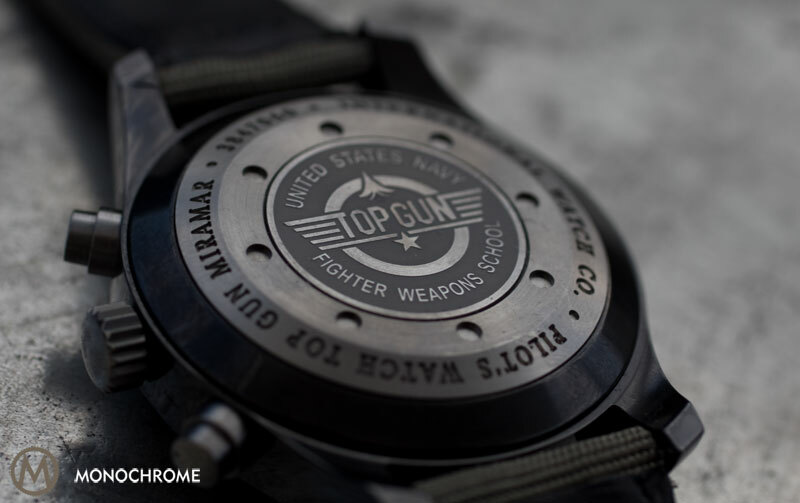 While most TOP GUN watches already feature a black case and dial, the new Pilot’s Watch Double Chronograph TOP GUN Ceratanium ref. IW371815 adds black pushers and a crown (they tend to be metallic) and black-coated hands with dark-grey luminous material. The sub-dials and the day-date wheels are also fully black. 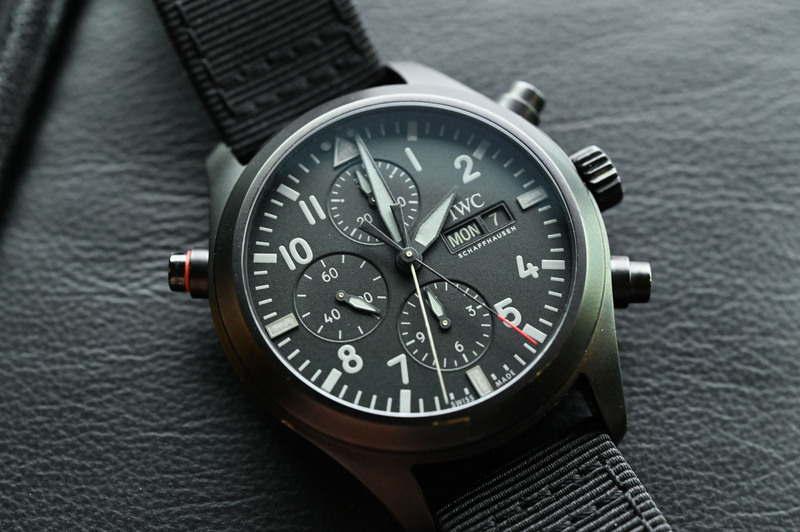 The IWC Pilot’s TOP GUN concept has never been so dark. 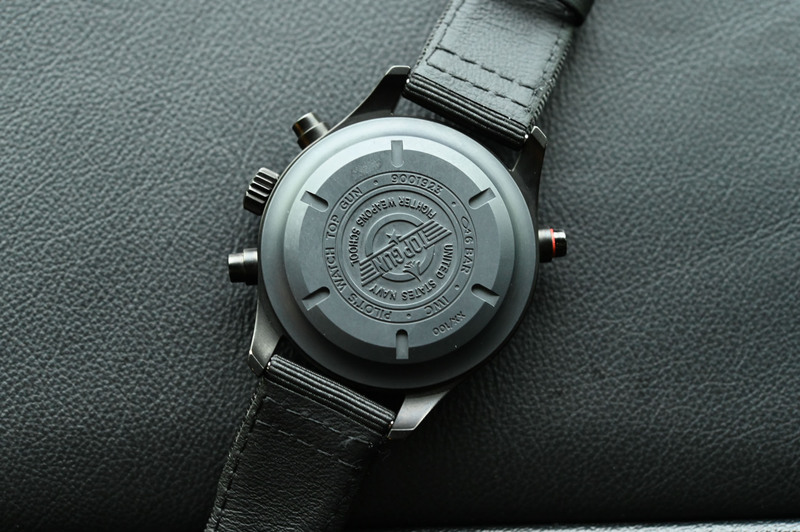 Complementing the look is a black rubber strap with a textile inlay. Finally, this watch marks the first time a Ceratanium case has been used in the Pilot’s collection (introduced in 2017 on the Aquatimer). Ceratanium, a proprietary IWC material, combines the advantages of titanium and ceramic, as it is as lightweight and unbreakable as titanium and at the same time as hard and scratch-resistant as ceramic. This has enabled IWC to create a completely black design, without a coating, including all watch components such as the caseback, push buttons or the pin buckle. The case measures 44mm in diameter and 16.80mm in height (IWC’s split-seconds watches never come thin). The IWC Pilot’s Watch Double Chronograph TOP GUN Ceratanium is also faithful to pilot’s requirements and is pressure tested and anti-magnetic, thanks to a soft-iron inner case. This reference IW371815 won’t be limited in production. Availability to be confirmed. Price is EUR 15,400. More details at iwc.com. I like IWC timepieces in general but those models with the blunted hands… what’s that all about? The old one had blunted hands, not the new ones. The arrogance of man knows no bounds.